We would like to inform that our office will be closed for a national holiday on Monday, September 3rd. Should you have any inquiries during this period, please kindly send us e-mails for our immediate response upon our return to office. We would like to inform that our office will be closed for 3 separate holidays in the coming weeks, Hung King Holiday on Wednesday, April 25; Reunification Day on Monday, April 30; and for International Labor Day on Tuesday, May 1. We would like to inform that our office will be closed from Wednesday (Feb 14, 2018) to Tuesday (Feb 20, 2018) for Lunar New Year Holiday. Should you have any inquiries during this period, please kindly send us e-mails for our immediate response upon our return to office on Tuesday (Feb 20, 2018). Wishing you and your family a very happy Lunar New Year! We would like to inform that our office will be closed this Monday, Dec 25, 2017, for Christmas Holiday, and Monday, January 1, 2018 for New Year's Holiday. Should you have any enquiry on those days, please kindly send us e-mails for our immediate action upon our return to office on Tuesdays Dec 26, 2017, and January 2st, 2018. Wishing you and your family a joyous Holiday Season and throughout the New Year! Please be advised that our Hussey Seating Asia-Pacific office will be closed from 31st August (Thursday) to 4th September 2017 (Monday) for internal training and Public Holiday. Should you have any inquiries during this time, please kindly contact us via e-mail. We will respond to you as soon as possible upon our return to office on 5th September 2017 (Tuesday). Many thanks for your kind attention and understanding. Effective from 17 June 2017, the extensive area code for landline numbers in Ho Chi Minh City will change from "8" to "28". Our landline numbers will be changed as below accordingly. We would like to inform that our office will be closed on Monday (May 1) and Tuesday (May 2) for International Labor Day. Should you have any inquiries on these days, please kindly send us e-mails for our immediate action upon our return to office on Wednesday (May 3, 2017). We would like to inform that our office will be closed from Thursday (Jan 26, 2017) to Monday (Feb 6, 2017) for Lunar New Year Holiday. Should you have any inquiries during this period, please kindly send us e-mails for our immediate action upon our return to office on Monday (Feb 6, 2017). We would like to inform that our office will be closed this Friday (Dec 23, 2016) for Christmas Holiday. Should you have any enquiry on that day, please kindly send us e-mails for our immediate action upon our return to office on Monday (Dec 26, 2016). Please be advised that our Hussey Seating Asia-Pacific office will be closed from 26th August (Friday) to 4th September 2016 (Sunday) for internal training and Public Holiday. Should you have any inquiries during this time, please kindly contact us via e-mail. We will respond to you as soon as possible upon our return to office on 5th September 2016 (Monday). Please be advised that our Hussey Seating Asia-Pacific will be closed from 15th April (Friday) to 17th April 2016 (Sunday) for Hung King Holiday. Should you have any inquiries during this time, please kindly contact us via e-mail. We will respond to you as soon as possible upon our return to office on 18th April 2016 (Monday). Our office will be closed during February 5th (Friday) to February 14th (Sunday) 2016 for Lunar New Year's holiday. Please kindly be advised that there would be some delay in our reply during this period. Your requests will be resolved when we resume our work on February 15th, 2016 (Monday). Thank you for your understanding. We wish you a New Year filled with health, wealth and happiness. We are excited to announce that our Hussey Asia-Pacific office has moved to a new office location on January 1, 2016. This relocation is a result of continued business growth and an increase in professional staff. Our new office is just minutes away from Ho Chi Minh City centre - Vietnam's largest and fastest growing economic and business hub. The new office address and contact information are as below. Should you have any queries on the relocation, please feel free to contact us. Thank you for your continued support and we hope to welcome you to our new Hussey Asia-Pacific office. Wishing you a Happy, Healthy and Prosperous New Year. We are delighted to announce our strategic partnership with Datascrip today. Under this agreement, Datascrip will become our exclusive distributor of Hussey's seating products across all regions of Indonesia. We are confident that this partnership will be beneficial to our mutual customers, bringing them higher levels of local support and service. We value our clients in Indonesia and happy to welcome Datascrip to our Asia Pacific distributors. Please contact Datascrip for any inquiries about Hussey's seating products in Indonesia. Hussey Seating Asia Pacific is excited to announce we have entered into a strategic agreement with AMK International Corporation Ltd. (AMK) to have appointed them as our new exclusive distributor of Hussey's seating products in Hong Kong market. AMK International Corporation Ltd., an established Hong Kong based global sourcing and engineering company founded in 2003, specialises in the sourcing, marketing, distribution and installation of premium imported architectural products for the medical, hospitality, commercial, performing arts, and educational markets in Hong Kong, Macau, Singapore, Indonesia, Malaysia and mainland China. We are confident that the partnership will bring an increased range of coverage and strength of representation of our seating products to this important market. We value our clients in Hong Kong and happy to welcome AMK to our Asia Pacific distributors. Please contact AMK for any inquiries about Hussey's seating products in Hong Kong. Hussey Seating Asia Pacific is now member of three international school associations including East Asia Regional Council of Schools (EARCOS), The Federation of British International Schools in Asia (FOBISIA) and Association of China and Mongolia International Schools (ACAMIS). As the only seating company being associate member of all three associations, we are dedicated to proving the highest quality and safest seating systems solution for schools in the Asia Pacific region in particular and other parts of the world in general. About EARCOS: EARCOS is an organization of 149 member schools in East Asia with a total of more than 100,000 pre-K to 12th grade students. EARCOS also has 173 associate members - textbook and software publishers and distributors, universities, financial planners, architectural firms, insurance companies, youth organizations, etc. - and 24 individual members. About FOBISIA: Founded in 1988, FOBISIA is a membership of British schools in Asia, aiming to promote a British style education system in schools throughout the region and give students the opportunity for collaboration and friendly competition through its annual sporting and musical festivals. About ACAMIS: ACAMIS was conceived in 1999 by a few schools in China and Mongolia that were searching for a way to have their athletic teams participate in post-season tournament play. Nowadays, ACAMIS is linking 70 member schools ranging in size from less than 300 students to over 2,500 in Mongolia, mainland China, Hong Kong, Macau and Taiwan. In addition to the continued connections for students through sport tournaments and cultural events, ACAMIS also helps school staffs through professional development programs and networking opportunities. Hussey Seating Asia-Pacific is delighted to announce the release of a new regional web site designed with a fresh new look and user friendly navigation. Containing all the latest information about our public seating products and services we will be regularly updating the content with helpful information, news articles and sharing some of our success stories. We value the feedback of our customers and distributors and welcome any suggestions to improve all areas of the website. 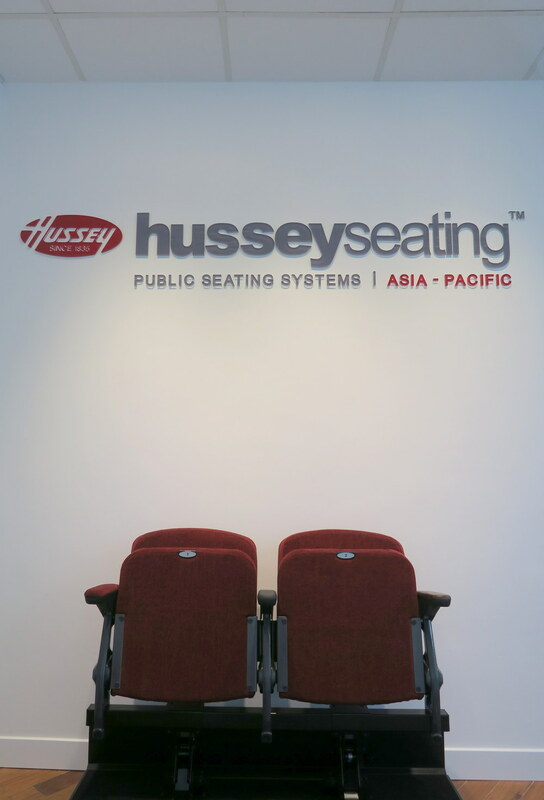 Please send us an email on asia-pacific@husseyseating.com should you wish to help continually us improve.